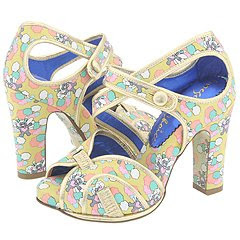 I bought another pair of Irregular Choice shoes!! This time I went for quite a blocky pair of heels, with straps across the front. This isn't my normal style as I dislike cutting off part of my feet with straps, but these are nice. They're comfy too for such high shoes. The padded sole will definitely help ease the height. And there are cute little bears printed on the shoes. I bought these online at Schuh, and had them delivered to the Dundrum store for free. Now that's just great service from Schuh.